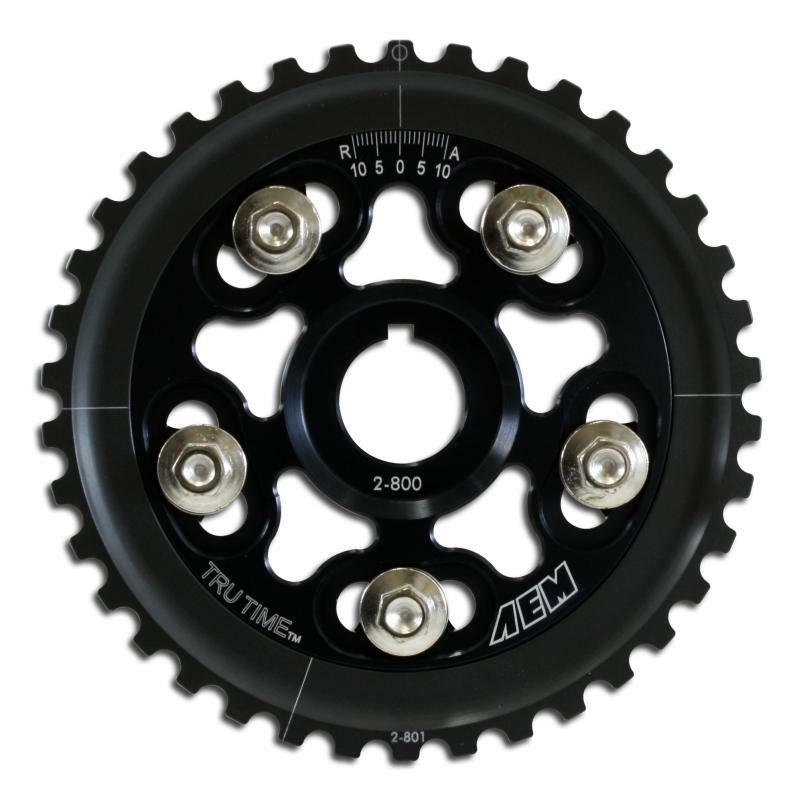 AEM TRU-TIME Adjustable Cam Gears increase horsepower and torque without having to change the camshaft(s) and are must-have items for engines that are milled, forced induction, high compression and/or utilizing aftermarket competition cams. Our gears enable users to match cam timing with their vehicle’s tuning state by advancing or retarding the cam profile in one-degree increments via true laser-etched markings. Precision-cut gear teeth ensure no premature wearing of the belt surface and AEM’s anodizing on the gear teeth is lab-test proven as the hardest anodizing process on the market. AEM TRU-TIME Adjustable Cam Gears are available in a multi-spoke, five-bolt design for most vehicles and our classic full-faced, three-bolt design for select applications. Five-bolt cam gears have an “8” in the suffix (23-8XX), and three-bolt cam gears have a “6” in the suffix (23-6XX). All AEM Tru-Time Adjustable Cam Gears are sold PER GEAR, DOHC Motors will need to buy Quantity: 2. The markings on here are very easy to read, allen bolts are strong as well.